The marijuana industry in the United States is rapidly growing and innovating. To date, a total of twenty-three states and the District of Columbia have laws legalizing medical cannabis. Ten more states are expected to vote on legislation that could legalize marijuana for medical or recreational purposes this year. Lawmakers, medical patients, business people, celebrities, doctors and voters are all broadening their perspectives about this multipurpose plant. The emerging positive perception of marijuana is combined with significant research aimed at unveiling new therapeutic properties and developing novel cannabis-based treatments. New equipment for testing, growing, harvesting, processing and tracking the plant after cultivation is also being developed. Software applications match desired mental and physical effects of cannabis to particular strains available in inventory to create unique and specialized blends; RFID trackers are attached to plants to record monitoring data; state-of-the-art display monitors are set up in dispenser shops; point of sale systems are integrated to allow for purchases with iPads and seeds and plants are genetically engineered by pharmaceutical companies to create specially designed products for pain relief and treatment of conditions such as MS, epilepsy, sleep deprivation, depression and cancer among other ailments. The current article will discuss the state of the medical marijuana industry in the U.S. and present the R&D tax credit opportunity available to support innovative companies entering this expanding market. Eligible costs include employee wages, cost of supplies, cost of testing, contract research expenses, and costs associated with developing a patent. On December 18, 2015, President Obama signed the bill making the R&D Tax Credit permanent. Beginning in 2016, the R&D credit can be used to offset Alternative Minimum tax and startup businesses can utilize the credit against payroll taxes. ArcView Group, based in San Francisco, and New Frontier, based in Washington. Those firms recently released a 300+ page report on the State of Legal Marijuana Markets. The report showed that the legal marijuana industry is one of the fastest growing industries in America with a compound annual growth rate of 31%. By 2020, legal market sales are expected to surpass $22 billion, with recreational sales comprising about 53% of the total legal market." That $22 billion dollar figure could potentially be higher. Many marijuana markets in the U.S. are still legally closed to legitimate entrepreneurs. A number of those states, however, are expected to vote on the issue in the near future. 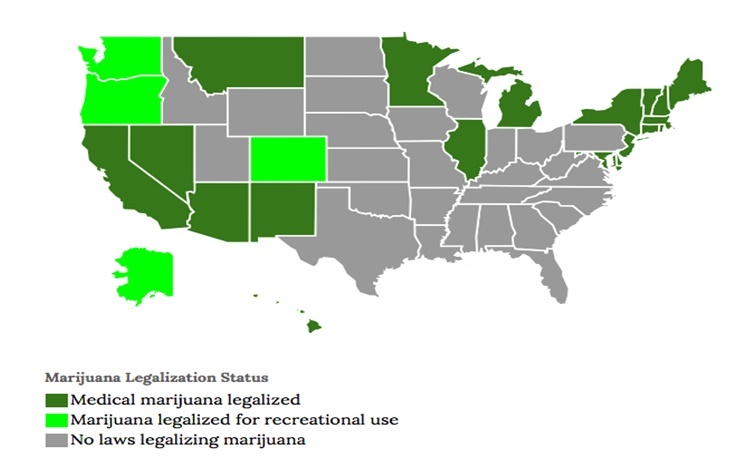 Seven states are expected to vote on the issue for recreational purposes in 2016: Arizona, California, Massachusetts, Maine, Nevada, Rhode Island and Vermont. Four more states are expected to vote on whether to approve it for medical use (Florida, Ohio, Missouri, and Pennsylvania). Colorado, Washington, Oregon, and Alaska markets are already open for recreational purposes. As shown in the chart below, 23 states have approved marijuana for either medical and/or recreational purposes to date. Since the mid-nineteenth century, American doctors have used marijuana to treat conditions ranging from asthma to insomnia. Nowadays, an ongoing cultural shift is breaking down those negative perceptions. Meanwhile cannabis’ medicinal properties are increasingly recognized and accepted . The plant is currently used to treat a variety of symptoms in patients suffering with HIV/AIDS, glaucoma, cancer and chemotherapy, multiple sclerosis, epilepsy, and other debilitating illnesses. Cannabis has helped these patients combat nausea, appetite loss, pain, and anxiety. In many cases, marijuana represents an alternative to prescription drugs, which often bring more serious side effects. Various patients that do not respond to traditional medications consider marijuana a more effective line of treatment. The expanding medical marijuana industry has attracted a growing number of corporate participants. Headquartered in Seattle, Washington, Privateer Holdings is America’s first private equity firm to focus exclusively on the medical cannabis field. With the objective of providing pure, reliable medical marijuana to patients, Privateer Holdings funds various companies, in the U.S. and Canada. Among such companies is Arbomain, a startup that offers Washington businesses I-502-compliant facilities that support industrial scale cannabis growing, testing, and processing. Believing that cannabis is the “next great American industry”, San Francisco-based ArcView Center aims to be a premier hub for marijuana investment, data, and progress. Since 2010, the ArcView investor network has raised over $17 million and funded over 34 companies. Other examples of participants in the fast-growing U.S. medical cannabis industry include healthy lifestyle company Neutra Corp. Based in Sarasota, Florida, the company is engaged in the marketing and development of innovative products designed to revolutionize and streamline the cultivation and commercialization of cannabis. Such is the case of a new portable indoor growing platform that should help cannabis growers keep their operations versatile and mobile. The development of novel cannabis-based treatments is a particularly promising field for innovation. Recent research has investigated the benefits of cannabis or cannabinoids (the chemical compounds secreted by cannabis flowers) in treating Alzheimer’s, Parkinson’s, and Huntington’s disease, as well as bipolar disorder and diabetes. Findings of a preclinical study published in the July 2014 edition of the Journal of Alzheimer’s Disease supports that small doses of THC, a chemical compound found in marijuana, could slow down the synthesis of beta-amyloid protein. The chemical may be explored in the development of drugs to prevent the accumulation of beta-amyloid plaques in the brain, which is a hallmark of Alzheimer’s disease. Recent studies have also shown that cannabis compounds may help control blood sugar levels in people with diabetes. Users of marijuana seem to have better carbohydrate metabolism - on average, they presented fasting insulin levels 16 percent lower than nonusers. Further research is necessary to determine how cannabinoids affect the relationship between appetite, caloric intake, and insulin response. Based in Colorado Springs, Colorado, Cannabis Science Inc. is committed to discovering novel cannabinoid-based therapies to improve patients’ lives. The company focuses on critical ailments, from cancer and infections to age-related illnesses and neurobehavioral disorders. Ongoing R&D efforts include the development of a cannabinoid-based treatment to basal and squamous cell carcinomas. In spite of a booming demand for medical marijuana, a very strict drug war-era tax code often threatens new businesses’ profitability. Moreover, rigorous licensing systems impose significant obstacles to cannabis growers and dispensers. In this highly regulated market, companies must rely on innovation to support more efficient operations. As demand for medical marijuana grows, the development of new technologies for yield optimization becomes crucial. Full spectrum LED lighting as well as automated systems for indoor growers stand out as particularly promising areas for innovation. With the ability to directly affect yields, lighting can contribute to increasing productivity. LED grow lights, in particular, are becoming the go-to lighting option for indoor growers. In addition to consuming less electricity and saving space, this technology puts out less heat than traditional grow lamps, which reduces refrigeration needs. Full spectrum LED grow lighting are particularly effective. By providing a wide range of blue, red, white, and ultraviolet light this technology mimics the sun and offers the necessary light for both the vegetative and flowering growth stages. The challenge for indoor growers is finding the optimum ratio of different colors and the implementation of necessary cycles, which provides the right amount of light and dark each day in order to stimulate growth and ensure proper THC production. Significant innovation should also take place on the consumer/user side. New and remarkable methods for consuming cannabis are already emerging, such as “vape pens” and hand-held vaporizers that allow users to inhale cannabis vapor instead of combusted smoke. 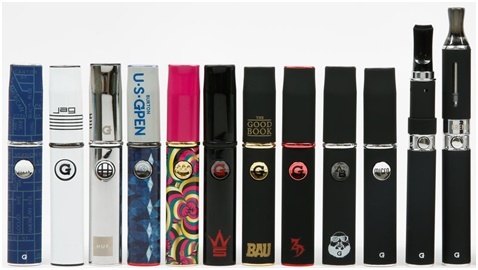 The vaporizer pens, which are very similar to e-cigarettes, are designed to vaporize the active molecules in concentrated marijuana oils, delivering high levels of THC. By helping overcome the stigma of smoking pot, the innovative pens are enabling even greater acceptance to cannabis-based treatments. Besides cultivating new plants, researching and developing new treatment methods and improving efficiency during the growing, harvesting and consumption process, a wealth of additional new peripheral products are being developed. These products range from innovative edibles like THC chewing gum and frying oil to tech products like affordable automated systems for home growing and mobile apps for ordering and analyzing products. They also include new point of sale equipment to speed purchases, RFID tags to track plants during transportation and air filters that plug into home electrical outlets. Software analytical tools are being developed as well. Recently, (April 20, 2016) Phylos, an Oregon biotechnology startup announced its intentions to begin offering an online interactive guide that visually portrays the genetic relationships of almost 1,000 different types of cannabis. Basically, Phylos created a colorful, 3-D, dynamic and interactive map that represents the statistical relationships between different breeds of plants. Users can identify different strands by their common nicknames such as “OG Kush,” “Blueberry” & “Sour Diesel” or more traditional blends such as “Northern Lights” or “Purple Haze”. The idea is to provide genetic information to consumers about each blend so they can make more informed ordering choices. Mowgli Holmes, Phylos’s chief science officer, as well as a molecular and evolutionary biologist said “We’ve collected samples from all over the world, and cataloged the genetic information encoded in their DNA.” He compared the DNA sequence to a bar code that uniquely identifies the samples and how they interrelate. Having access to this information will help bring order to an underground business making a transition to commercial legitimacy. As marijuana has become a commercial product, people are increasingly trying to identify the unique blends they like or want to avoid, be it for medical or recreational use. The legalization of marijuana in more and more states around the country is enticing hedge fund managers, venture capitalists and private equity firms to make a potentially very lucrative investment. Many of these investors are willing and even eager to invest in the rapidly growing cannabis market. As previously stated, Arc View, the legal cannabis industries premier hub for investment data, helps to connect cannabis companies with potential investors and has helped 54 startup companies raise $41 million. Other hedge fund managers appear to agree. Brendan Kennedy, chief executive of Privateer Holdings saw the Bob Marley cannabis brand worthy enough to invest in. The hedge fund recently announced the creation of Marley Natural, the world’s first global cannabis brand. Privateer Holdings and the Marley family began discussing the possibility of working together in early 2013 and quickly realized their common values – social change, environmental sustainability and building a professional, responsible and legal cannabis industry . Some hedge funds use public markets to invest in marijuana. Anders Hove and Bong Koh’s VHCP Management recently disclosed long stakes in GW Pharmaceuticals PLC- ADR (NASDAQ:GWPH) shares. They invested in over 300,000 shares when the company announced that its Orphan Drug and Fast Track-tagged Epidiolex (cannabidiol) enjoyed positive results in a Phase 3 clinical trial for the treatment of Dravet syndrome, a rare and still untreated form of childhood epilepsy. According to the results, the drug considerably reduced seizures experienced by the children in treatment. Pharmaceutical companies developing an orphan drug to treat an uncommon disease may be able to take the research credit for qualified research expenses or the orphan drug credit for development costs attributable to qualified clinical testing incurred in developing the drug. IRC section 45 provides an enhanced version of the R&D tax credit for drugs that the FDA designates as an orphan drug. The tax benefit which is designed to offer an incentive to pharmaceutical companies to develop drugs to treat uncommon diseases provides a credit equal to 50% of the development costs attributable to qualified clinical testing. Similar to costs considered qualified under the research tax credit, costs considered qualified under the orphan drug tax credit include wages paid to employees for qualified services, i.e., to conduct, directly supervise, and directly support qualified clinical testing activities. As voters and state legislators express growing support for medical marijuana, demand for new treatments and technologies intensifies. Throughout the country various universities are engaged in responding to such demand. Researchers at the University of Colorado at Boulder, for instance, are performing the deepest-ever exploration of cannabis genome. The so-called Cannabis Genomic Research Initiative will sample DNA from multiple cannabis species from all over the globe. The material will be analyzed, sequenced, and mapped at an unprecedented level of detail. New understanding of cannabis’ genomic information is expected to unleash great potential for medical applications. University of California is also engaged in the field of medical marijuana. Created with the purpose of assessing the safety and efficacy of cannabis for treating medical conditions, the Center for Medicinal Cannabis Research coordinates and supports related research throughout the State of California. Ongoing studies include the use of cannabis for treating HIV-related peripheral neuropathy, the analgesic efficacy of smoked cannabis, and the effects of cannabis therapy on spasticity in multiple sclerosis patients. The largest psychiatric affiliate of Harvard Medical School, McLean Hospital recently received a $500,000 gift to fund its new Marijuana Investigations for Neuroscientific Discovery (MIND). The initiative is the first of its kind and aims to question whether marijuana affects patients’ cognitive function, positively or negatively, and why. Preliminary research shows that cannabis could potentially improve cognitive performance of patients with severe medical disorders that affect cognitive function and mood. Researchers at Stanford University are also investigating the medicinal properties of marijuana and of cannabinoids. A recent survey showed that a cannabidiol-rich cannabis extract might be effective in treating children with epilepsy. Further research should determine which specific kinds of epilepsy are better suited for cannabidiol treatments, the potential side effects, and the interactions with other anti-seizure drugs. The marijuana legalization movement has never been stronger in the U.S. The hotly debated plant is already allowed in twenty-three states, where a growing number of patients take advantage of the medicinal properties of cannabis. Innovation should help the medical cannabis market flourish, leading to the development of revolutionary cannabis-based treatments and ancillary products. Federal and state R&D Tax Credits are available to stimulate the efforts in marijuana innovation and should be taken advantage of, accordingly.